KUALA LUMPUR: Builder Hua Yang Bhd, with a niche in affordable housing, currently has about a dozen projects throughout the country with a gross development value (GDV) of RM650 million. Chief executive officer Ho Wen Yan said for the current year ending March 31 2012, the company will be launching projects with a total GDV of RM525 million. About a third of the GDV or RM154 million has been fully booked, which is the 418-unit serviced apartment at One South (Phase 2). "Of the seven projects to be launched in the current year, 70 per cent of the GDV or RM370 will be in Selangor, 24 per cent or RM126 million in Johor and the remaining RM29 million in Perak," he said in an interview with Business Times. Besides serviced apartments, other components that will be launched within its One South project in Sungai Besi this year include 156 units of offices and two blocks of serviced apartments (Phase 4). Others are landed residential properties in Bandar Universiti Seri Iskandar in Ipoh, and Taman Pulai Jaya, Taman Pulau Hijauan and Polo Park in Johor. Ho said One South is the company's largest project in Klang Valley, with a GDV of RM840 million. The project, to be developed in five phases on a 6.68ha land, is expected to be completed in 2018. One South - an integrated development comprising residential, offices and retail - is Hua Yang's flagship project. "We will not target this project based on consumers' income level but rather on the requirements, such as first-time homebuyers, new families, newly married and young families," he said. He said Hua Yang has a total of 314.8ha undeveloped landbank in Peninsular Malaysia, with an estimated GDV of RM2.2 billion. The company plans to acquire more land to replenish its landbank. "We are talking to landowners throughout the country. The focus is key urban centres and towns with huge working population as our strategy is to go where there is demand for affordable houses," he said. The company has also acquired a piece of prime land measuring about 0.62ha in the middle of Desa Pandan commercial centre for RM32 million. It plans to develop a mixed serviced apartment and commercial centre with an estimated GDV of RM160 million. MAIN Market-listed Hua Yang Bhd plans to introduce its affordable housing to Sabah and Sarawak. The company is currently talking to landowners to acquire land near city centres there. "Sabah and Sarawak are our next market. We've done a lot of study and we believe the population and economic growth there will generate strong demand for our houses," chief executive officer Ho Wen Yan said. 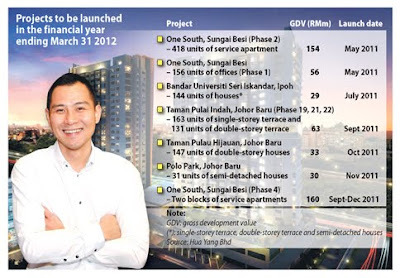 Currently, Hua Yang's property projects are concentrated namely in Klang Valley, Johor and Perak. The company, which was incorporated some 33 years ago in Ipoh, has no plans for now to go abroad. Ho said the market is still big in Malaysia and the company wants to grow its market share here. However, he said Hua Yang may bring its affordable housing model abroad, probably into Asian market in the next three to five years' time. Merger and acquisition (M&A) is also not the company's way of expanding. "We want to build a sustainable business over the long term ... We don't want to overborrow and we want to grow organically so that we can handle the growth," he said.